Please select from our wide selection of Playa del Carmen vacation rentals. Kindly select from our vacation rental categories below or perform a search to your left for a specific Playa del Carmen vacation rental. Please feel free to call our office should you have any questions or concerns. USA: 617-314-6232 Mexico: 984-873-3548. Our deluxe properties mix style and affordability. 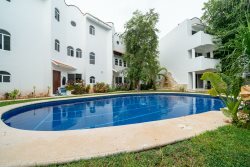 Renting a deluxe property is a great way to enjoy Playa del Carmen and save a little money while not giving up too much in terms of quality. Our ocean view rentals offer stunning Caribbean sea views from within the unit or from a private terrace which is part of the property.